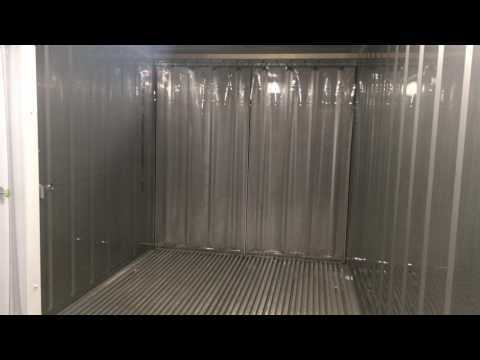 Model: 8' x 20' x 8'6"
This trailer reefer unit has a heavy duty 24' trailer with twist locks for securing container, front deck, low pro fenders, 7000 lb. spring axles, forward self-adjusting brakes, LED lights and polyurethane paint (overall length: 29'). With new 3 HP pre-installed refrigeration system -All electric, quiet operation, no need to refuel or hook-up charge for the refrigeration, just bring power to the cold storage container and you’re ready! Double cargo door (7'6" x 7'4"H) with heavy duty hardware and vinyl strip curtain kit included - Best door system in the industry! Polyurethane foamed in-place insulation - The cold storage container industry's preferred insulation. LED lights - pre-wired, ready to go. White steel exterior panels with stainless steel lined interior walls & ceiling & aluminum floor with (4) drains - For easy clean out and sanitary maintenance! T-rail reinforced aluminum flooring (pallet jack and forklift rated) - Ready for any heavy loads & traffic. Full all weather roof for outdoor - indoor use - Air-tight / Water-tight storage. Forklift pockets on each side - For easy transport. Upgrade to additional 3' wide service door & 12' aluminum loading ramp available - Can be pre-mounted on either side. (1) 7'6" x 7'4" Double swinging door.